Last month the 40,000 meals AIG Boston Office and Lexington Insurance colleagues packaged during our Day of Giving Back took off for the Salesian Missions in Swaziland, a partner of Stop Hunger Now. The Salesian Missions works to enable impoverished children in Southern Africa to live better lives and build brighter futures. “Thank you to all who contributed to this effort: Know that the couple of hours you spent in August are making a significant difference feeding children and families a world away,” said Valerie DiPietro, head of the AIG Boston Office/LexCares committee. Annual Holiday Giving Project: As a long standing tradition to help make a significant difference to families during the holiday time, the AIG Boston Office/LexCares committee this year have partnered with an all-volunteer organization, Christmas in the City. Christmas in the City has served the homeless and severely impoverished community in Boston for over 20 years. Its core value is to foster the spirit of the holiday by spreading kindness, goodwill, and caring to neighbors. AIG Boston Office and Lexington employees generously donate toys and money that will help Christmas in the City’s mission for each child at their holiday party receive a gift from their Santa list. On December 1, ten employees volunteered at their Giving Tuesday event. Volunteers were tasked to assist low income families signup for the Christmas in the City December 21 toy room shopping. The coordinator was thrilled for the volunteers help and they signed up over 200 families. On December 21, approximately 25 employees will volunteer at Christmas in the City escorting the families through the toy room and helping them with their toy selections. Christmas in the City will help brighten the holidays for thousands of children through the generosity of caring people like Lexington employees. Lexington and AIG Boston Office continues to place high importance on giving back to the community and acts of community service. In celebration of Lexington 50th Anniversary, Lexington and Boston Office employees spent August 12 Giving Back to the City of Boston. Volunteers were very enthusiastic and committed giving their time and help to The Esplanade Association, Cradles to Crayons, and Stop Hunger Now. During last year, employees volunteered about 900 hours. In, just a single day, on August 12, Lexington and AIG Boston employees exceeded those hours with 232 of them volunteering to give back to the City of Boston. “I am extremely proud of the success we achieved, working together to give back to three impactful organizations in our community. It was a great way to celebrate our 50th anniversary, continuing Lexington’s longstanding tradition of volunteering time and effort to our community,” says – Lexington’s President and CEO Jeremy Johnson. 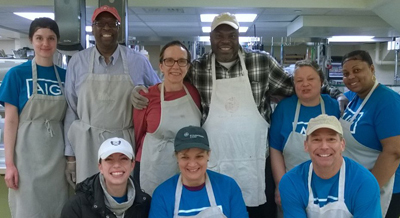 Lexington and AIG Boston Office employees continue to highlight the importance of positively and selflessly contributing to the community by volunteering time and effort into various acts of community service. Check out the infographic highlighting employees’ volunteerism in 2014. Lexington Insurance and AIG Boston Office are very proud to have a strong volunteering spirit within the organization. One of Lexington and AIG Boston ongoing efforts is working with an organization called Homefront Hugs, supporting troops deployed in troubled areas. Lexington and AIG Boston Office have partnered with Homefront Hugs and currently sponsor six adopted heroes. Over the past year, Lexington and AIG Boston Office employees have sent approximately 94 packages overseas to their heroes, far surpassing the goal of one per month. One employee who went above and beyond is Michelle Serra, Underwriter, Environmental. Michelle wanted to do something special and handmade a beautiful quilt to send to a hero, Priscilla, stationed in Kuwait. The quilt is red, white, and blue, and parts of the fabric have flags on it and “Thank You” all over. The quilt turned out great, and it was a very thoughtful gesture that Pricilla will love. Thank you, Michelle, for your kindness and making a difference. On August 12, Lexington and AIG Boston Office will host a Day of Giving Back to the City of Boston as part of Lexington’s 50th Anniversary celebration. All Lexington and AIG Boston Office employees will get the opportunity to give back to their community on August 12. Employees will get to choose between four charities to volunteer with on that day. It will be a great day to give back and help out the community. Lexington participated in the Steps to Success program put on at a local Brookline school, where a class of fifth and sixth graders came to the Boston office for a special career day on May 6. Thirteen Lexington employees came together to prepare an interactive two-hour presentation for the children topped off with an AIG version of Jeopardy to close the event and to test what the kids had learned. It was a huge success - the kids were very engaged and asked lots of questions. AIG and Lexington take pride in giving back not only to their community, but to communities thousands of miles away. This month Lexington helped students in our own area as well as those in need across the world. April was the Global Volunteer Month of which employees enthusiastically took advantage. 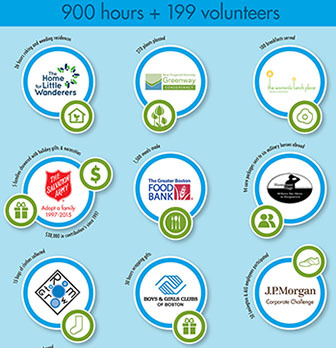 Over the course of the month, AIG/Lexington employees put in 336 man hours giving back to the community. One of the volunteer projects was with Stop Hunger Now, a nonprofit whose mission is to provide food and life changing aid to those in the world’s most vulnerable countries. On April 28, 85 volunteers worked to package over 20,000 meals for Stop Hunger Now that will be sent to Malawi. It was a great event and the volunteers had lots of fun. We thank all the volunteers for their time and support. On February 19, eleven employees volunteered at The Women's Lunch Place (WLP) organization kitchen helping to prepare and serve over 265 meals to WLP’s clients. The Women’s Lunch Place organization, a staff favorite, aims to help underprivileged women focus on turning their lives around.